Grilled Chile Vodka Fish Tacos are THE taco of the summer. The tilapia takes on a ton of flavor from the chile vodka marinade before it hits the grill! 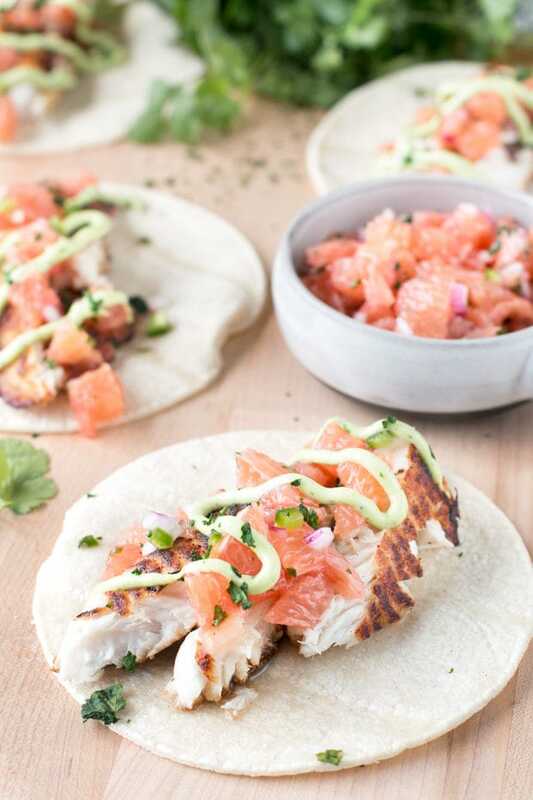 When you top off the fish with a bright grapefruit salsa and refreshing avocado jalapeño crema, it’s impossible to resist diving in for one (or three) more. Disclosure: This post is sponsored by Breckenridge Distillery! While I was compensated in exchange for this post, as always, all opinions and the recipe are my own. Thanks for supporting the brands that support Cake ‘n Knife! After spending a couple of blissful weeks in Europe, I am back to the ol’ grind. Thankfully the ol’ grind includes cooking amazing things like these fish tacos, so really, I can’t complain. I remember when returning to work after vacation was literally torture. This was generally because I would be heading out to a new destination immediately after returning home. There was one of these trips that brought me out to San Diego once I returned from vacation, and despite all my grumblings about not being home long enough, this trip ended up having a huge impact on me. The huge impact came down to one. epic. taco. Much like the fish tacos I ate in Kauai, btw. Instead of marinating these fish tacos in tequila though, I decided to shake things up a bit. Breckenridge Distillery Vodka is literally the only vodka I drink. I wasn’t a big vodka girl until I had theirs, to be quite honest. Breckenridge Distillery‘s vodka is smooth and clean, almost refreshing when you drink it straight (i.e. no alcohol shudder included). 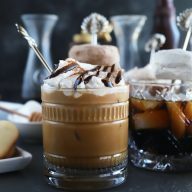 In cocktails, it almost has a subtle sweet flavor, so I use it all the dang time. Then they came out with a Chili Chile Vodka…. And I fainted. 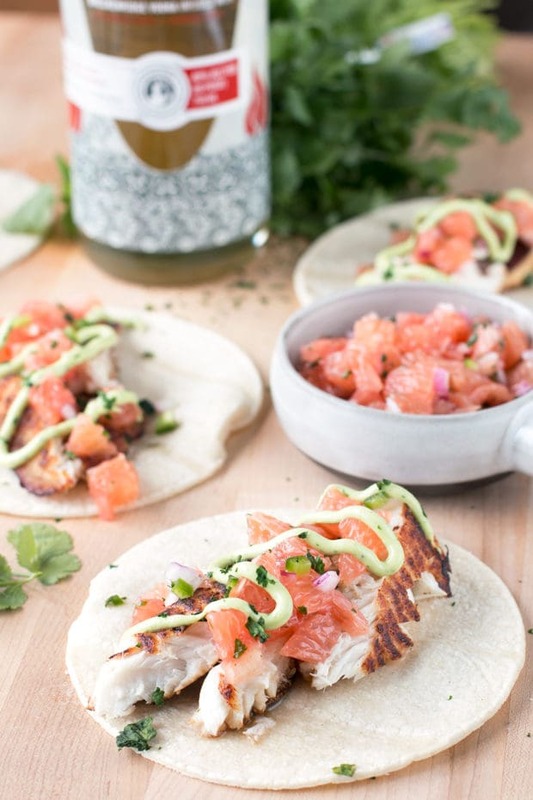 The smoky spicy flavors in this vodka compliment the fish perfectly in these tacos. The fish ends up being light and refreshing with a spicy bite to it. 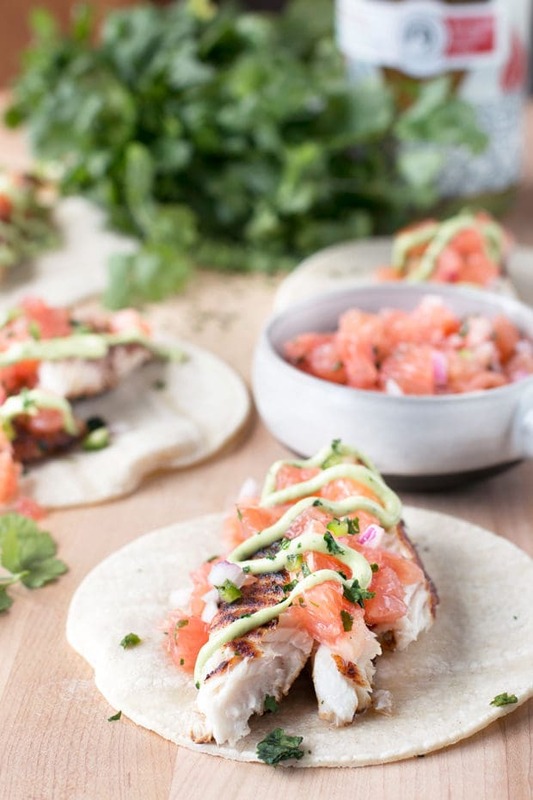 When you add it to a taco with a crisp grapefruit salsa and drizzle on a refreshing avocado jalapeño crema, it’s basically the best bite of a fish taco you could ever experience. Your summer grilling adventures simply have to include this taco – if only to experience the glory that is the Chile Chili Vodka marinade. 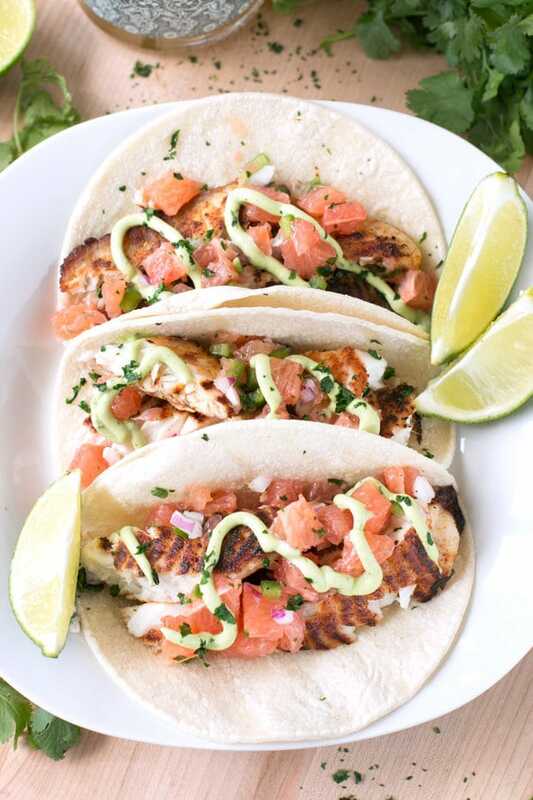 Step aside tequila, your fish taco days are over. Stainless Steel Mixing Bowls – because I would literally lose my mind without them. 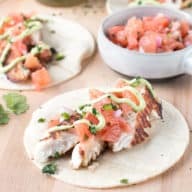 Pin this Grilled Chile Vodka Fish Tacos recipe for later! 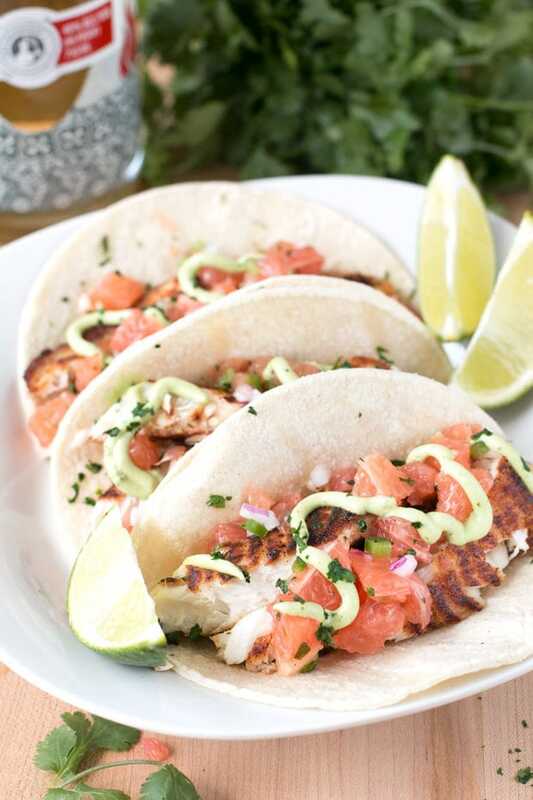 Spicy vodka marinated tilapia gets grilled up and topped with a refreshing grapefruit salsa. Drizzle with a cooling, yet spicy, avocado crema and you have the new taco of the summer! In a medium bowl, whisk together Breckenridge Chili Chile Vodka, cumin, chili powder, garlic, cayenne and lime juice. Add tilapia filets and marinade for 10 to 15 minutes. In a small bowl, stir together ingredients for the grapefruit salsa. Set in refrigerator until ready to serve. In the bowl of a food processor, add ingredients for the avocado jalapeño crema. Puree until smooth. Set in refrigerator until ready to serve. Heat up grill and season with oil. 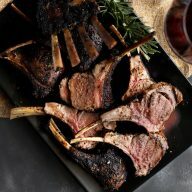 Add fish to grill (ideally using a fish basket to avoid the filets breaking apart) and cook approximately 3 minutes per side, until cooked through. Remove fish from grill and cut fish into short strips. 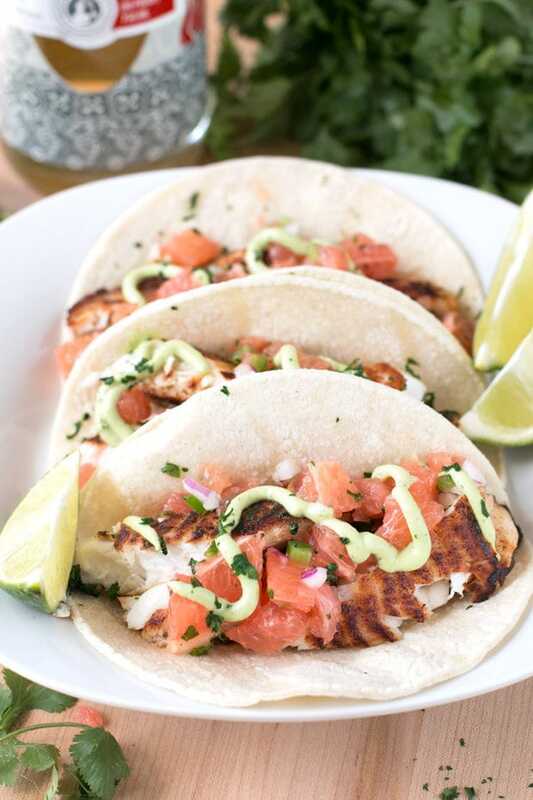 To assemble to tacos, add 3 to 4 small pieces of fish to each corn tortilla. Top with grapefruit salsa and avocado jalapeño crema. Garnish with a pinch of fresh chopped cilantro and serve with lime wedges. Sounds AMAZING Meghan! I want that SoCal fish taco taste too!!! Thanks so much Ann!! 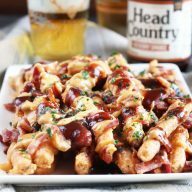 🙂 I know you’ll love this recipe!